HELPViz: Integrated CommunityViz – Land-use Model | Resource Systems Group, Inc.
RSG designed and implemented a new, two-level approach to land-use forecasting that integrates econometric land-use modeling techniques—implemented in TransCAD—with CommunityViz’s GIS/3D visualization functionality and parcel-level detail. 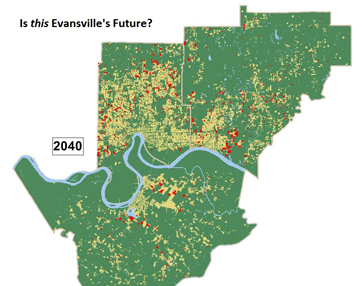 The Evansville region has experienced moderate, steady growth in recent decades but struggled with increasing vacancy in some areas as new development outpaced overall growth. A new regional plan for sustainable development, supported by a grant from the United States Department of Housing and Urban Development (HUD), hopes to address this trend and decrease the pace of land consumption. The model helps to provide motivation for renewed efforts to encourage more sustainable development patterns by illustrating the long term implications of current trends. The model also helps to inject realism into the development of plans by helping clarify the limited effectiveness of zoning alone. The two-level system designed and implemented by RSG works as a set of spatial nested logit models. 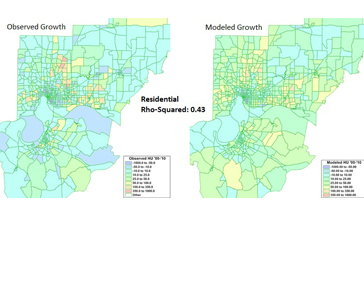 The attractiveness of the lower-level choice of parcel-level building locations informs the upper-level choice allocating population and employment growth among zones. The system results in static, repeatable estimates of zonal population and employment as well as a probabilistic allocation of buildings at the parcel level, allowing 3D visualization. The system is calibrated to historic land-use development patterns observed at both census block and parcel levels. Model estimation results square with intuition, faithfully reflecting the importance of many factors in growth patterns. The resulting model was able to reasonably replicate historic development patterns and produce a range of realistic future scenarios.